In this chapter, the agent model of network formation discussed in the previous chapter is extended to applications in biology to describe the formation of tracks and aggregates in myxobacteria and trail formation in ants. We will again exploit the basic features of the Brownian agent model, (i) discrete internal degrees of freedom θi to cope with different behavioral responses and (ii) the generation of a self-consistent effective field he(r, t) by agents. 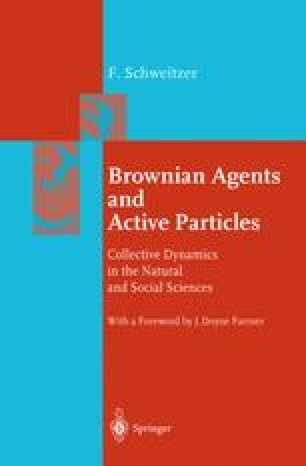 However, different from other chapters, we will describe the motion of Brownian agents continuous in time and space in this chapter by a discrete approximation. In this approximation, the simple Brownian particle (performing an overdamped motion) would become a random walker and the Brownian agent with its different activities would then become an active walker — a term that from now on shall be used equivalently.